TBILISI, Georgia (CNN) -- Russian forces appeared to be in control of two key Georgian cities early Friday, and there were reports of tanks on the move again. 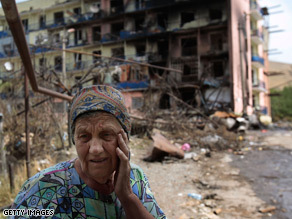 A woman outside a bombed apartment block in Gori, Georgia, on Thursday. Russia said Thursday that its withdrawal of Gori would be complete within hours, and the U.S. said it looked like the Russian military was gearing up to leave, but CNN's Michael Ware confirmed that Russian troops were comfortably in control of Gori in the early hours of Friday. The town was a base for the Georgian military and is near the breakaway South Ossetia province where the conflict began. Meanwhile, there are reports of Russian vehicles on the move towards Poti, a port city in the west of Georgia. Georgia's President Mikheil Saakashvili said that more than 100 tanks and other vehicles are traveling in convoy between the cities of Senaki and Kutaisi. CNN has not independently confirmed the claim. "I appeal for the help of every civilized person in the world to stop this uncivilized, barbarian, inhuman, treacherous, absolutely outrageous behavior, and to save innocent lives," Saakashvili said. He estimated that Russian soldiers control about one-third of his country and said his government has received 1,400 reports of brutal attacks. The U.S. official said there were also troops in Poti, having been put ashore in the Black Sea port several days ago. Russians have been accused of bombing targets in Poti, including a military installation and ships. Russian Foreign Minister Sergei Lavrov denied Wednesday that there were Russian troops in Poti. But a CNN crew that tried to drive to Poti on Thursday found the road blocked by Russian soldiers. U.S. Defense Secretary Robert Gates, who has been charged with a major humanitarian mission to Georgia, warned that U.S.-Russian relations could be hurt "for years to come" but ruled out any U.S. military action in the region. Russia -- which supports the separatists, many of whom claim Russian citizenship -- responded the next day, sending tanks across the border into the province. The conflict quickly spread to parts of Georgia and to Abkhazia, another breakaway region. Concern beyond Georgia's borders prompted European leaders, spearheaded by French President Nicolas Sarkozy, to mediate a cease-fire deal and U.S. President Bush to offer humanitarian support. International agreements signed in the early 1990s allow Russian peacekeepers to maintain a presence in South Ossetia and Abkhazia as part of a force including Georgians and South Ossetians. Analysts see the conflict as a gamble initiated by Georgia, which is seeking EU and NATO membership, to test the strength of its Western allies in the face of Russia's unwillingness to see the West encroaching on its doorstep. In five days of fighting, both sides accused the other of targeting civilians, with casualty reports in the thousands. Many more people have fled the fighting into Russia and Georgia, leaving heavily bombarded towns and cities deserted. Meanwhile, Russia's deputy chief of general staff, Col. Gen. Anatoly Nogovitsyn, said that a withdrawal plan to pull troops from the breakaway region had yet to be approved by Russia's defense ministry or its president, Dmitry Medvedev. During a Moscow visit by the leaders of South Ossetia and Abkhazia, Lavrov said that Georgia's current borders were "limited," an indication that the two breakaway regions may never agree to rejoin it. All three voiced their unity against what Abkhazian leader Sergey Bagapsh called "those aggressors from Georgia." South Ossetian leader Eduard Kokoity compared Georgia's initial assault on the region's capital Tskhinvali, which prompted the Russian invasion, to Germany's attempt to seize Stalingrad during World War II. iReport.com: Are you reminded of past wars? Do you remember the Cold War? "Tskhinvali has become the Stalingrad of the Caucusus," Kokoity said at a joint news conference. "The fact that the biggest number of bombs fell on purely economic and civilian targets clearly indicated that was a premeditated thing and it had nothing to do only with Abkhazia or South Ossetia," Saakashvili said. Russian peacekeeping troops were also in the western Georgian city of Zugdidi, just outside Abkhazia. Video showed the Russians, clearly wearing the blue helmets that signify their peacekeeper status, at the official government residence in the town. iReport.com: How is the Russia-Georgia conflict affecting you? U.S. officials said Russia is thought to have 15,000 or more troops in the region, between 5,000 and 7,000 more than when the fighting began. Russia's Lavrov said Russia's operations were about "peace enforcement" in respect of Georgia, which "violates all of its obligations."